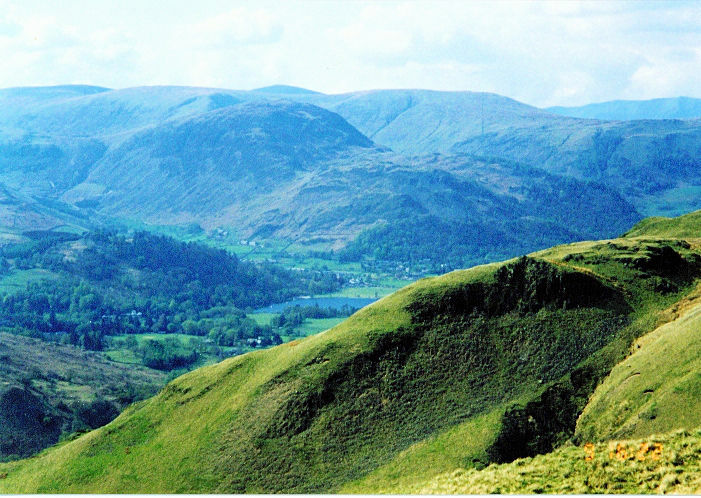 Being a Yorkshireman, I am naturally fond of the Dales and the rich diversity of walks in my home county but in all honesty the Lake District and its spectacular views is as good as it gets in terms of hill walking. I had eagerly looked forward to reaching the Lake District since the first step of the walk from the coastline at Robin Hood's Bay. Thus I was naturally exited about the remainder of the trip as I awoke from my bunk bed in the bunkhouse of the Crown Inn, our accommodation location in Shap. We had enjoyed a great night in Shap and was euphoric as I woke to another glorious day. The boys were keen to get into the Lakes too and after breakfast we left Shap with a spring in our steps. We had not gone far before making our first stop to look over the remains of Shap Abbey. 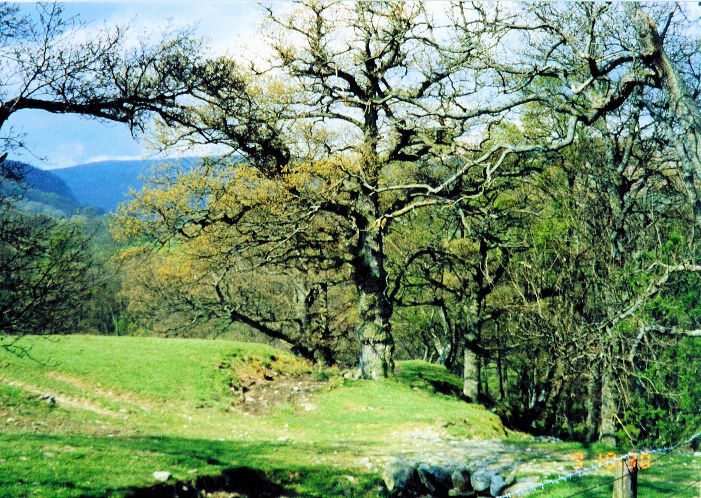 After a brief exploration of the ruins we tracked through lanes, fields and woodland towards Haweswater Reservoir on the fringe of the Lake District. There was a mishap as we neared the reservoir when Dave lost the contents of his rucksack while climbing over a stile near Naddle Bridge. This caused him to curse and threaten to turn back. He was not consolable so Steve and I moved on to the sleepy hamlet of Burnbanks at the dam end of reservoir. Dave walked alone, trailing us by about 200 yards. It was best that way for he was in a frightful mood and we feared that if we upset him he may well have turned back and given up. After the village it was a steady slog for 3 miles alongside the reservoir and easily the most frustrating part of my day. 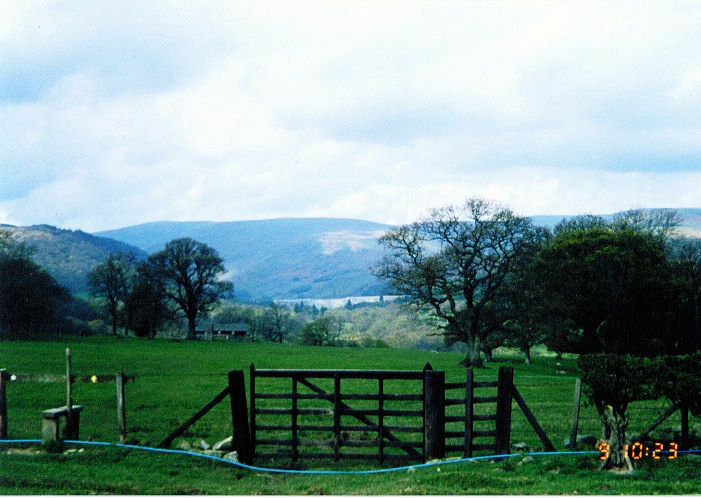 On this stretch walkers are pinned to the edge of the reservoir by the reservoir fencing to the left and the first ridge of Lakeland fells to the right. During this entrapment Steve and I walked along chatting away about Dave's paddy, both of us regularly casting an eye back to see he was still with us. He was, and halfway along this crappy interlude we stopped for a drink and waited for our companion. He arrived soon after and after complaining about his infernal rucksack he was back on good form. The crisis was over. 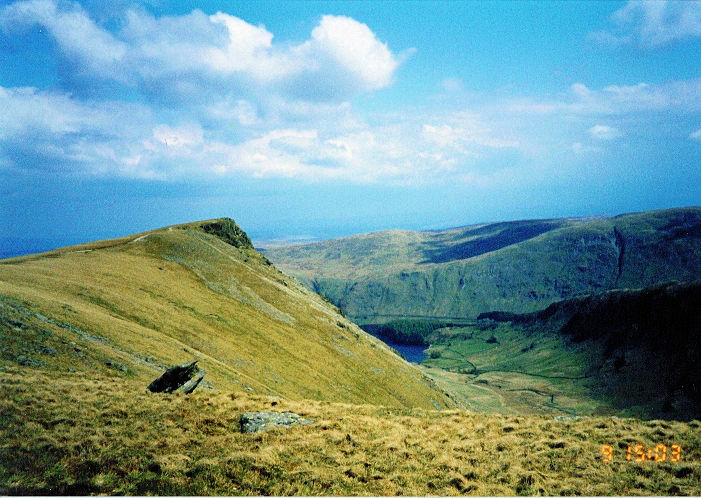 We all forgot the incident and looked forward to reaching the end of the reservoir and making height onto the fells. Eventually we arrived at Bowderthwaite Bridge that saw the end of our entrapment from the reservoir edge. Here, amid pleasant surroundings we paused for a break and steeled ourselves for the steep climb to our first Lakeland fell, Kidsty Howes. My first thoughts on seeing it were 'blooming heck' as it was a short but steep climb up to the top. After the break I huffed and puffed my way up 250 very steep metres to the top. So did Steve and Dave, this was our hardest climb of the entire day. But what a reward we got for our hard work on Kidsty Howes. We were on top of our world and in the best of spirits. The rest of the days walking was just fantastic. We tracked the ridge to Kidsty Pike enjoying spectacular views and from there skirting Rampsgill Head to The Knott. 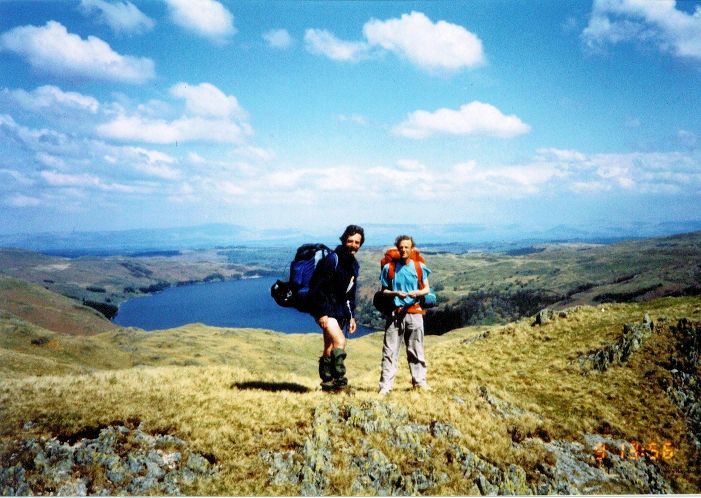 From there we remained high and made for Satura Crag and Angle Tarn. It was a brilliant time and a spell of walking none of us will ever forget. Doing a great walk in great views and whilst enjoying fantastic weather conditions is not something you can everyday, but I wish! We passed the tarn and its nearby Pikes before beginning our drop into Patterdale. It was here that Steve, the stalwart of our team so far buckled a little as we edged along a path with a steep drop to our left. He does not like exposed walking where a slip can have dire consequences. 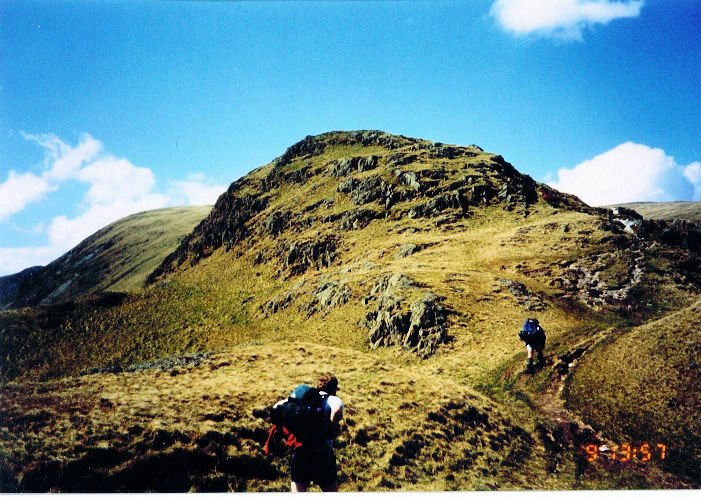 In reality its not nearly as bad as, say Striding Edge but there are areas here where a steady foot is favourable. Needless to say, we descended carefully and walked on into comforting Patterdale safe and sound.